The holidays are over, inventory is done. We have found a place for everything and put everything in its place, and Castle in the Air is fresh and new for 2011. I think the Baby New Year display in the front window has been attracting visitors partly because it’s so simple, so compact, and such a surprising change from what they expect. At the shop we tend to create over-the-top installations that take up the entire window, or the whole floor as in the case of our paper theatres, masks, and puppets display upstairs. 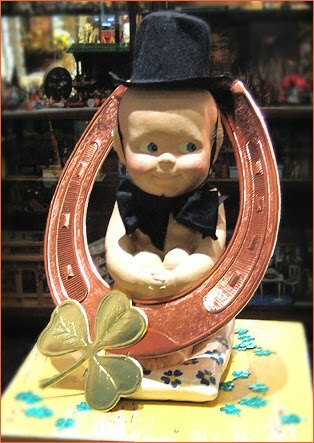 But with Baby New Year it’s just him in his top hat and tie, sitting on his lucky pedestal with an expectant look in his eye. He’s little, he’s ready, and he’s perfect. We'll be back to our outrageous extravaganzas in no time, I'm sure. And so be it--it's part of the fantasy we encourage at Castle in the Air. But in the meantime, we're happy to put away our dusters, arrange the treasures we unearthed during inventory, and make room for all the good things in store for us this year. and I think the "little guy" IS perfect! I llke the "expectant" look and the "ready for all good things" look on his little face. Can't wait to see what you found in the inventory....as if there weren't enough great things already! Happy New Year to all of you in the Castle!